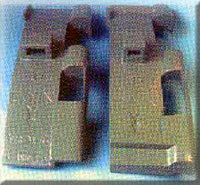 Used to secure the carbide inserts #106, 107, 105 to the mechanical holders #108, 109, & 110. 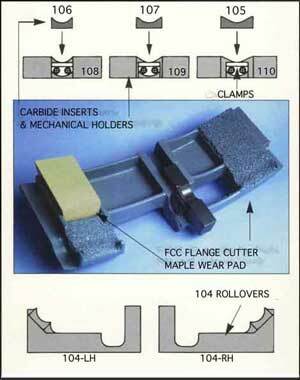 #104 Rollovers fit both FCC #501 and FCC #601 to quickly cut excess "Roll Over" wheel material on the treadside. Both FCC #501 (left & right) and FCC #601 (left & right) have the same basic overall dimensions, except for the brake head key pin side. FCC #501 inside dimensions measure 1/2" x 1" which is interchangeable with our pattern #186. FCC #601 inside dimensions measure 3/4" x 1 1/2" & is interchangeable with our patterns #191 & #628.